Alejandro Romero Gamarra scored on a penalty kick in the 69th minute and the New York Red Bulls kept their Supporters' Shield hopes alive with a 1-0 victory over rival Philadelphia Union. 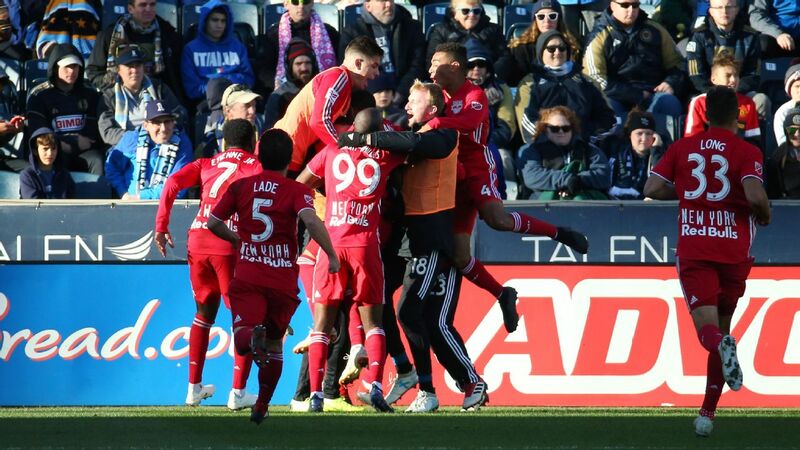 The Red Bulls kept pace with Atlanta United FC for most points in all of MLS after the Five Stripes earned a 2-1 victory over the Chicago Fire. The Red Bulls and Atlanta will play their final matches on the last day of MLS' regular season next Sunday. The Union controlled the action for most of their home finale, but the Red Bulls got the break they needed midway through the second half. On a corner kick intended for New York's Bradley Wright-Phillips, the Union's Alejandro Bedoya was called for a hand ball in the penalty area. Gamarra, better known as "Kaku," converted the penalty kick with his left foot, easily delivering the ball into a wide-open net when Union goalkeeper Andre Blake dived in the opposite direction. Both teams entered with a playoff berth in hand but had plenty at stake. In addition to the Red Bulls' Supporters' Shield chase, the Union was trying to move up a spot and into the third seed for the Eastern Conference playoffs. In a high-intensity matchup between regional rivals, tempers flared at the end of the first half when the Red Bulls objected to a hard foul on Gamarra. No discipline was given despite some pushing and shoving as both teams retreated to their locker rooms. The match did include five yellow cards, three of which went to the Union. Red Bulls goalkeeper Luis Robles had two saves in his 13th clean sheet of the season. Blake had three saves for the Union. Both teams missed prime scoring chances in the first half. Gamarra hit the near post on a left-footed shot in the 35th minute. The Union's Fabrice-Jean Picault looked to have a clear shot on goal in the 40th minute, but his right-footed shot struck teammate Bedoya and bounded away. The Red Bulls close out the regular season with a home match an Oct. 28 against Orlando City, while Philadelphia finishes at New York City FC on the same day. Philadelphia remains three points behind third-place NYCFC in the Eastern Conference standings, Wayne Rooney and D.C. United could pip both teams on the final day of the regular season if results go their way. Kaku scored a penalty-kick winner at Philadelphia to keep New York Red Bulls within a point in the Supporters' Shield race with one match to go.